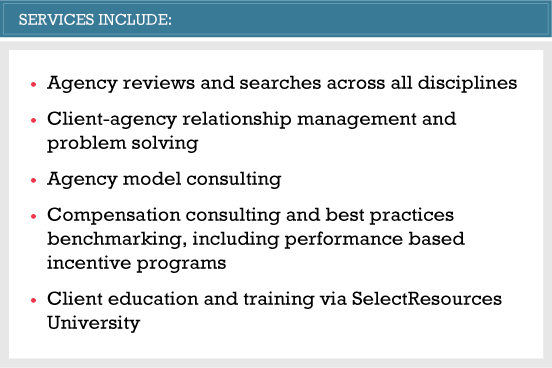 SelectResources International (SRI) is the nation's premier firm specializing in agency searches and relationship management. Our focus is on helping marketers and agencies alike both seek and nurture optimum partners in communication. Founded in 1992 by ex-agency CEOs and senior marketing executives, SRI has completed over 500+ agency reviews and related projects involving over $20 billion in billings. SRI clients range from entrepreneurial start-ups to established regional companies, from national advertisers to global marketers. SRI employs eight full-time professionals, including senior partners with years of experience in their areas of specialization. We maintain a proprietary database of over 2,000 agency fact sheets detailing the best generalist and specialist agencies of all sizes, from leading global networks to hot young start-ups. This is complemented by a comprehensive library of work samples and credentials from over 200 of the most highly regarded creative shops. Beyond this, we are committed to personally visit over 300 of the world’s leading firms each year, making SRI uniquely qualified to bring up-to-date agency intelligence to every project we undertake. Professional. Connected. Responsive. Knowledgable. And ready to help you find a mutually productive partnership. SRI helped us refine and finalize our objectives. This ensured a better mix of agencies in our search. Using a search consultant like SRI enabled McAfee to evaluate agencies that were never on our radar. The team at SRI also helped us stay focused while herding a diverse set of executives from around the globe. SelectResources International Copyright 1992 - 2019. All Rights Reserved.